A large number of Italian colonists moved to Tripolitania in the late 1930s. These settlers went primarily to the area of Sahel al-Jefara, in Tripolitania, and in the capital Tripoli. In 1939 there were in all Tripolitania nearly 60,000 Italians, most living in Tripoli (whose population was nearly 45% Italian). As a consequence, huge economic improvements arose in all coastal Tripolitania. For example, Italians created the Tripoli Grand Prix, an internationally renowned automobile race. 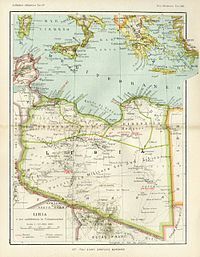 In 1937, northern Tripolitania was split into Tripoli Province and Misrata Province. Inn 1939 Tripolitania was included in the 4th Shore of the Kingdom of Italy. In early 1943 the region was invaded and occupied by the Allies; this was the end of the Italian colonial presence. Italy tried unsuccessfully to maintain the colony of Tripolitania after World War II, but in February 1947 relinquished all Italian colonies in a Peace Treaty. 1912: Treaty of Lausanne [it] ends the Italo-Turkish war. 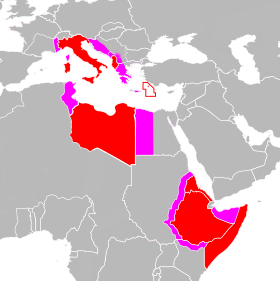 Tripolitania and Cyrenaica were ceded to Italy. 1934: Tripolitania is incorporated into the Colony of Libya. 1939: Tripolitania is made part of the 4th Shore of the Kingdom of Italy. ^ a b c d e f g h خليفة Kalifa Tillisi, “Mu’jam Ma’arik Al Jihad fi Libia1911-1931”, Dar Ath Thaqafa, Beirut, Lebanon, 1973. ^ Habib W. El-Hesnawi, "The Story of the Libyans' Jihad (Resistance) Against Italian Colonialism 1911-1943", Markaz Jihad al Libiyeen dhid al Ghazw al Itali, 1988. ^ Attilio Teruzzi, "Cirenaica Verdi", translated by Kalifa Tillisi, ad Dar al Arabiya lil Kitab, 1991.